HF with thanks to IDJ for the two adverts. 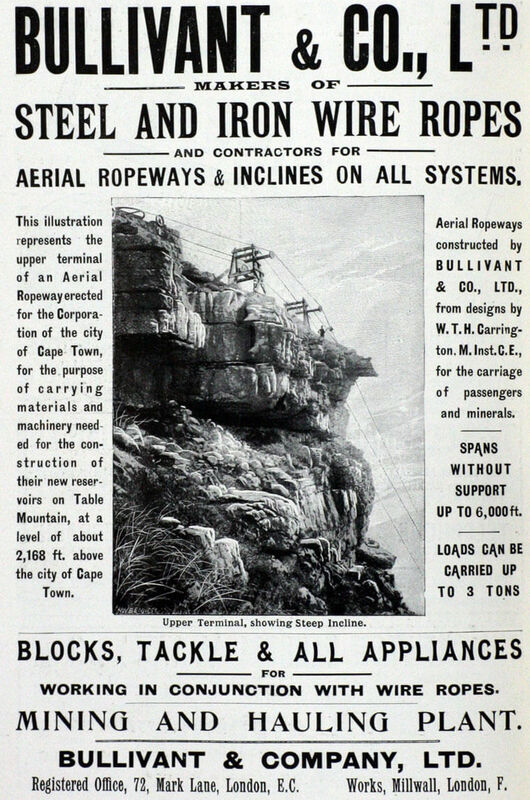 The cable used in the Aerial Ropeway constructed to link Takoo Sugar Refinery and its Sanitarium was made by Bullivant & Co. which began as a UK company. William Munton Bullivant was an early innovator in the stranded wire cordage field, invented in the mid-19th century by German mining engineers in the Harz Mountains and gradually improved upon and stimulated by the Industrial Revolution. 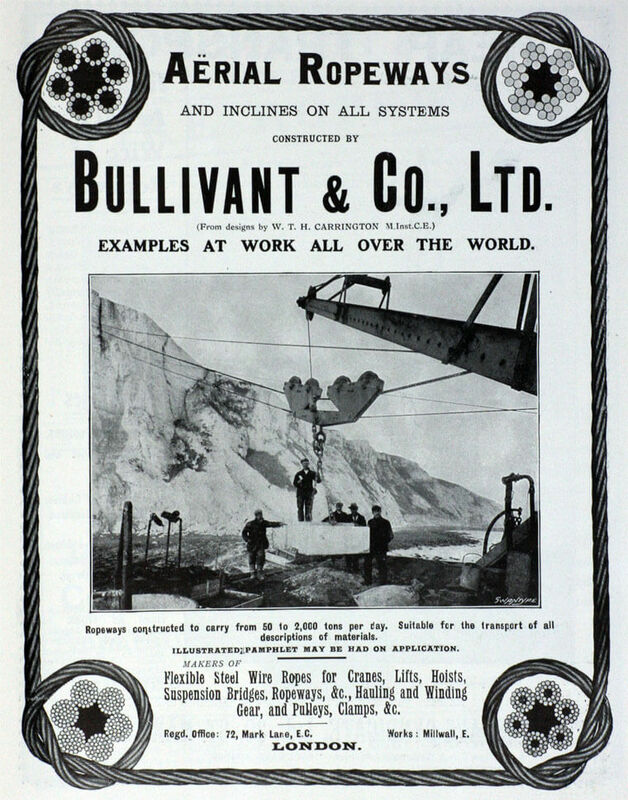 Sometime after 1875 Bullivant formed his own wire rope manufacturing firm, Wm. Bullivant & Co, at Millwall, on the south bank of Thames estuary, in London. A characteristic of the British wire rope market was that firms tended to be located in their specialist markets. For example roperies were located near the collieries and shipping yards they serviced and so Bullivants began to specialise in maritime and traction applications. Graces Guide in its brief notes on the company begins “Bullivant and Company, New Mills Court, Stroud, Gloucestershire. wire rope makers and engineers, and of Mark Lane and Millwall.” However, the company appears to be based in Millwall, London and I am can’t find any information that it had works in Stroud. 72 Mark Lane, London was its registered office. This article was first posted on 12th December 2014. Charles Booth Online Archive see: B89, 91-94 at 533291, 180803 Interview with Pelham Bullivant of Bullivant and Company. The link opens apparently unrelated maps. Dr Ferdinand Korn, Tai Koo Sugar and a case of the ‘British disease’? I’m researching Bullivant’s, and I’m not aware of a site in Stroud. In 1912 Bullivant’s set up a satellite factory in Leighton Buzzard, which was managed by my great-uncle, Tom Selby. Tom Selby was mate of the Cutty Sark and went on to work for the Indo-China Steamship Company. He then joined Bullivant’s. 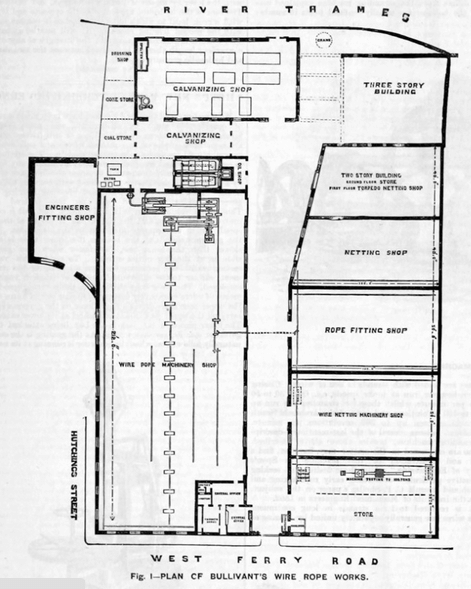 After the Leighton Buzzard site was closed he went out to Australia to set up a factory for Bullivant’s. The MIllwall site was managed first by my great-grandfather James Selby, and then by his son George Selby. A third brother, Chris Selby went to Vancouver to set up a Canadian factory. I am also researching Bullivant’s and your great uncle, but this is for a book that is being written about Leighton Buzzard during World War 1. So if you have information about your great uncles time there or perhaps a photo of him you would be willing to share. I would be most grateful. I would very much like to see the photo you have of the Bullivant object you saw on Samsø island. I will email you directly about this and perhaps you could send me the image. It would also be very interesting to read the article you say you are going to write about Bullivant & Co.